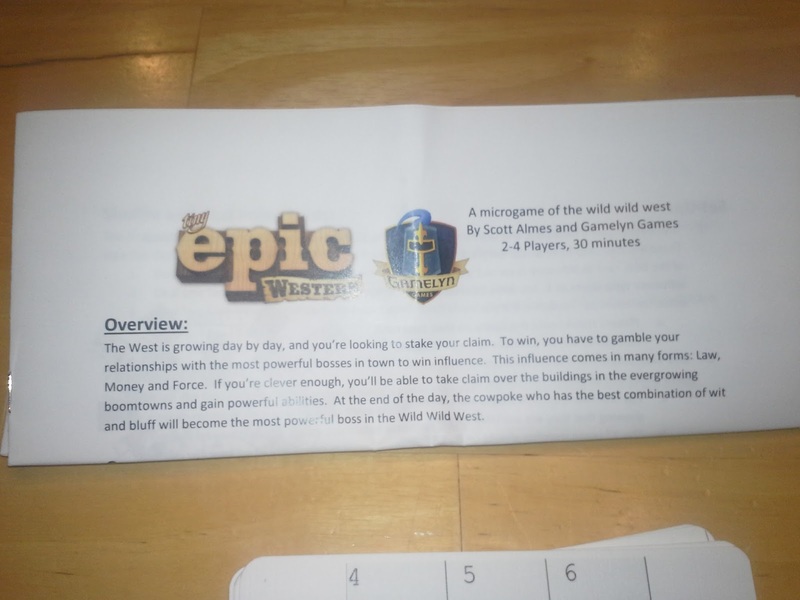 In November I entered a contest by Gamelyn Games to win a prototype copy of their much anticipated title—Tiny Epic Western! To my surprise I was one of the lucky ones chosen but it came with a catch which you are reading right now. 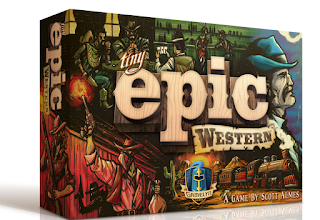 Tiny Epic Western—also known in the board gaming community as TEW—is the fourth game in the Tiny Epic series by Scott Almes and Gamelyn Games (not including expansions like Tiny Epic Kingdom: Heroes Call). It plays two to four players, is for ages fourteen and up, and lasts thirty to forty-five minutes. 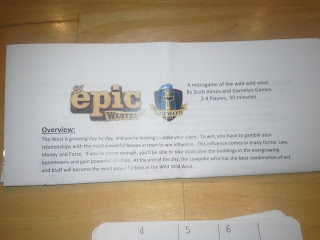 Thank you www.thegamecrafter.com for the icons. "The West is growing day by day, and you’re looking to stake your claim. To win, you have to gamble your relationships with the most powerful bosses in town to win influence. This influence comes in many forms: Law, Money and Force. If you’re clever enough, you’ll be able to take claim over the buildings in the evergrowing boomtowns and gain powerful abilities. At the end of the day, the boss who has the best combination of wit and bluff will become the most powerful tycoon in the Wild Wild West." 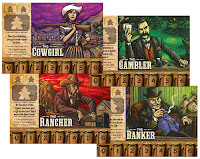 To set up Tiny Epic Western each player will choose a character board, a player board, three cowboy pawns of the matching color and one of each resource cubes. The resource cubes are placed in the number one slot on the resource track on the character card and the cowboy pawns are placed to the side with two standing and one laying down. 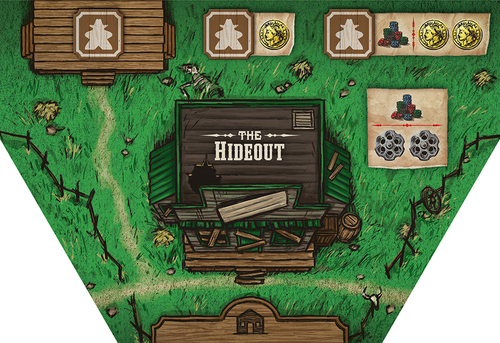 The players place the Town Hall, Sheriff's Office, and their player boards in a circle in the center of the table leaving a space between each one. 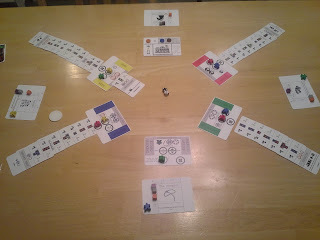 The player boards should line up in front of the player with the matching color cowboy pawns. If playing with less than four players flip the unused player boards to the side with no color. Next shuffle both the poker deck and building deck and place both decks face-down near the playing area. Select a player to go first and give her the first player token. Take the three stock tokens and place them near the Town Hall for later use. 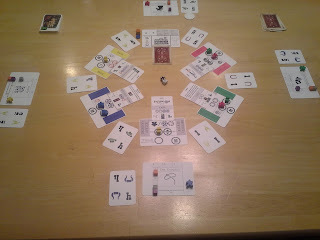 Finally take the dueling dice and place in the center of the circle within reach of all players. Typical setup for four players. 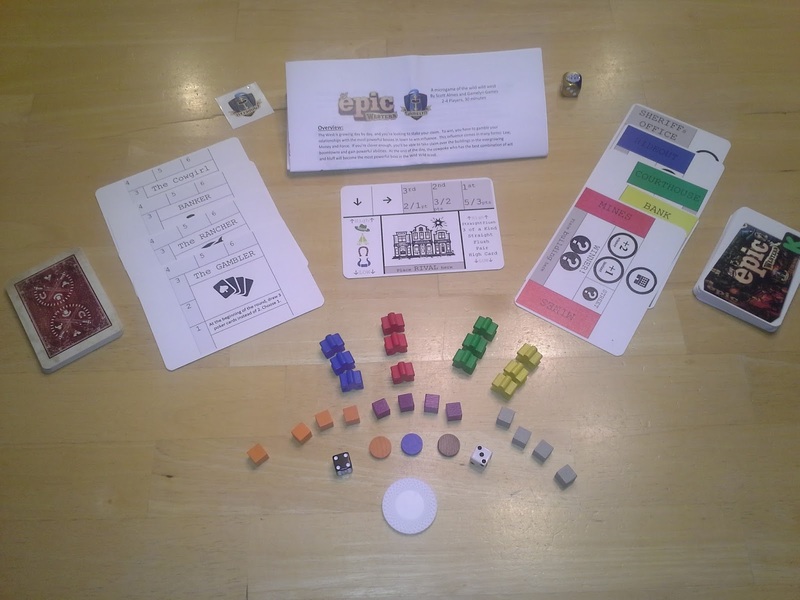 Game play consists of rounds split into phases when players will take turns. 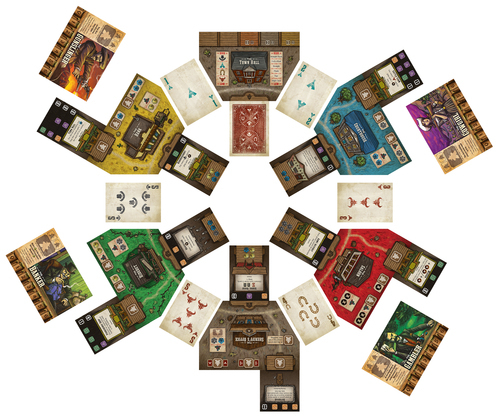 A round begins with one building card being placed face-up on each of the empty spots on the main buildings in the center of the table. Poker cards are then placed face-up between each building, one to the Rival at the Town Hall, then two to each player. 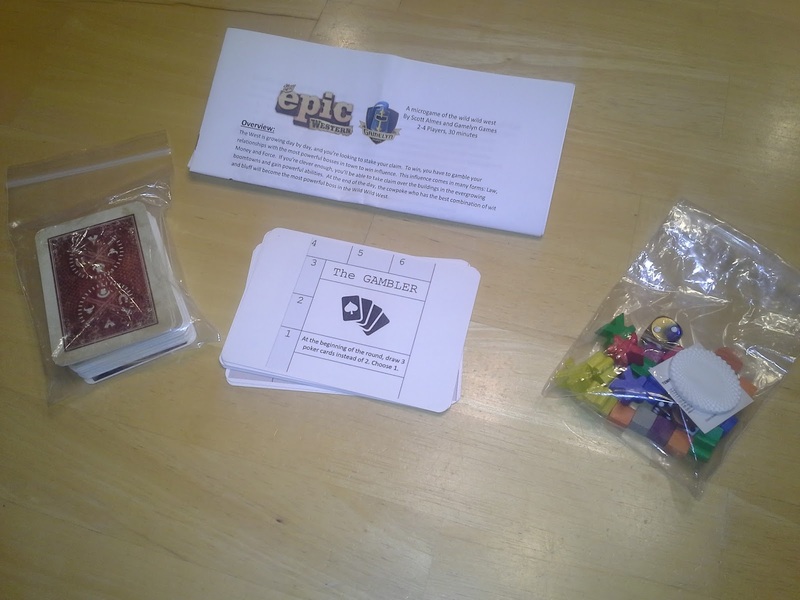 Players then choose one of the poker cards to keep and discard the other. Next in clockwise order starting with the first player each player will place one of their active cowboys onto either the Sheriff's Office or one of the player boards in the center taking the appropriate action or resource. If a player chooses a spot that already has another player's cowboy the players will duel. Placing cowboys continues until the last player has placed his last active cowboy—typically two cowboys per player. Once the cowboys are placed each location is resolved to see which player will win the overall "pot" for the building they are on. To do this all players turn over their poker card revealing what they have. 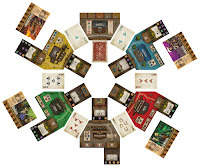 Then starting with the player board to the right of the Town Hall they use the adjacent poker cards and the one in their hand to form a poker hand. The player with the best hand wins. If there is only one player on a location that player is pitted against the Rival—whose card is also flipped over. The location is resolved the same way by whoever has the best poker hand. If the Rival wins then the player does not receive the "pot". 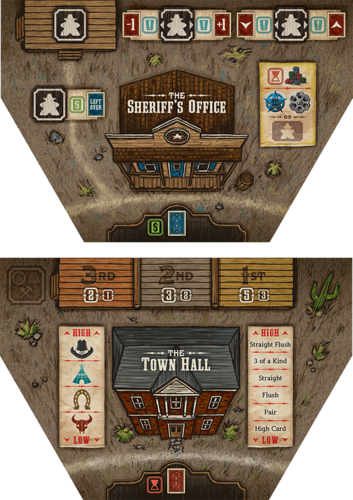 When the resolution phase gets back to the Town Hall it is resolved the same way but all players are now involved and the player with the best hand wins the Town Hall allowing them to move the stock token of their choice along the stock track. That player is also the first player to purchase a building during the buying phase. The next player with the best poker hand is the next to buy and so on through the player with the worst hand. Players will now add the purchased buildings to their player boards—always keeping the newest card on top to access it's power. 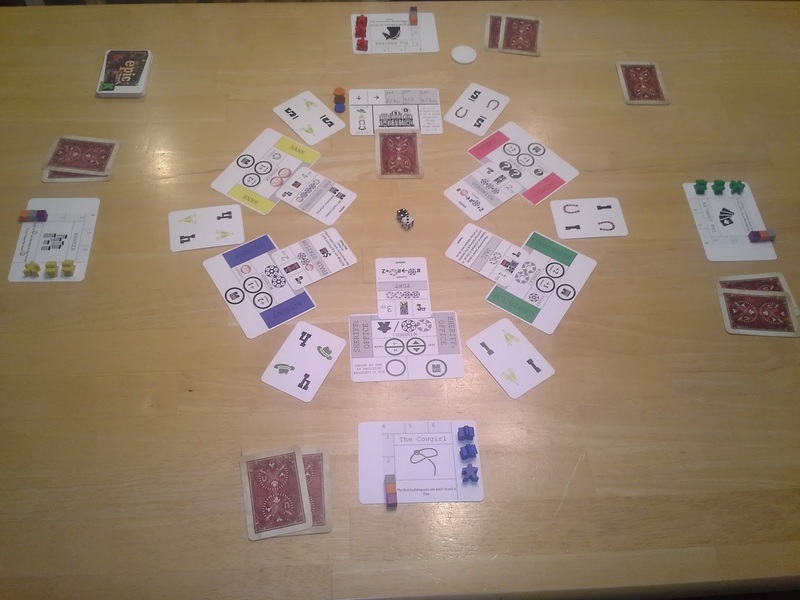 The round is now over and players move their cowboys back to their player sheet, remove all poker cards from play, pass the first player token clockwise and prepare for the next round. Play continues until two stock market tokens have moved over the FINISH LINE or the building deck is empty. Once this happens the game is over and players add up their scores. 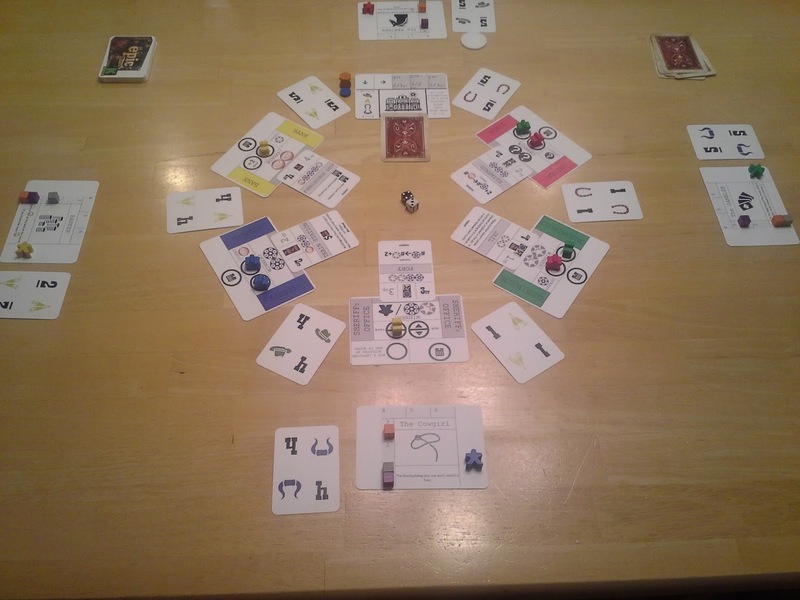 Players add up the points from each of their building cards then resolve the stock market. Whichever player has the most stock that finished in first place gets five bonus points while the second place player receives three points. The player with the most of the second place stock receives three points and the second place player receives two. The player with the most of the third place stock gets two points wile the player with the second most gets one point. Whoever has the most points wins!!! 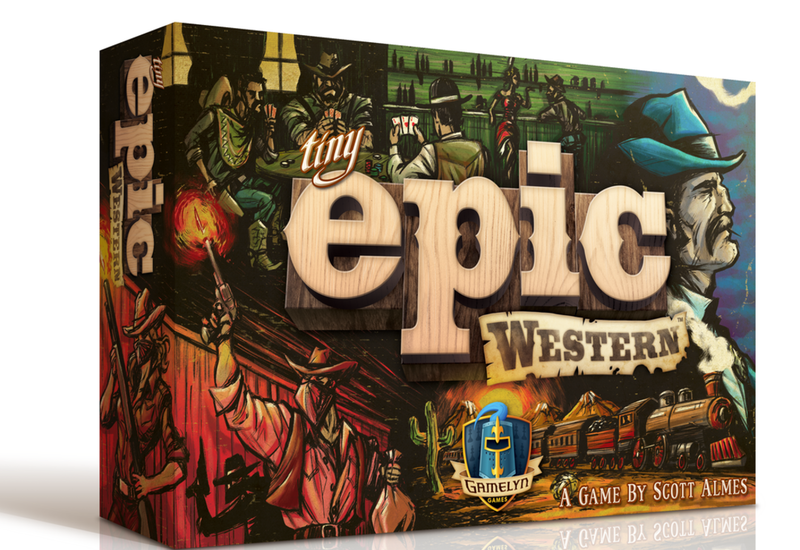 Tiny Epic Western is a great addition to the series and brings with it fresh mechanics and game play. As usual Scott Almes has packed a lot of game play into a small box which gives the game a lot of re-play-ability. The use of the poker mechanic along with the player duels really brought the western theme to life in this game. Although you could throw other themes onto the core of this game I am not sure it would feel as tightly married to the mechanics. Scott's use of the poker mechanic was a turn off to me at first as I am not fond of that game however after a few games it really grew on me. It works well with the theme—as I mentioned above—and is a great way to resolve the locations. It also creates choices for the players as they must decide the best card to use and where it will be most effective. The worker placement aspect is pretty standard with the exception of the duels. The choice of going where someone is already becomes a bit of a gamble as players roll to resolve, however this can be mitigated with the poker card in your hand. Although I didn't think that it fit thematically as well as some of the other mechanics I really enjoyed the stock market aspect. Players are competing to get the stock of their choice over the finish line first while trying to buy the building that have the same stock symbol to ensure they will have the most. This was a good push and pull and again made the choice of which building to buy about more than just the special power it gave you. I can't give an opinion on this as the components were all prototype. However I have seen some of the finished (I think) artwork and it looks great. As I mentioned above I really like the marriage of mechanics to theme on this one. I also like the choices that you have to make throughout the game. To me that is a mark of a good game. I also know that they will be adding much more content to the game for the Kickstarter which will give it even more depth and more versatility. Unfortunately this game is a little too complicated for my young kids—who normally play games well above their age level—so it won't hit the table very often at my house. The 14+ is a good age guideline for this game. Building special powers has to be my biggest gripe. Most of them were not powerful enough to entice me to choose over other actions available which was very different from Tiny Epic Galaxies. The fact that you could only use the top card's power made them seem very insignificant. I also think that players should have been able to use them in the circle before they were purchased and placed on a player's board. This may be a rule already that just wasn't very clear in the rough draft of the rules I received. All-in-all I like TEW and will play it with older crowds when I get a chance. I am giving it 4 out of 5 super meeples. Coming to Kickstarter January 11, 2016! Great review! I can't wait to add it to my collection!